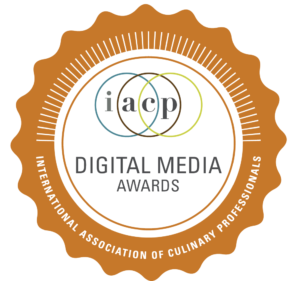 The Digital Media Awards honor nine categories of traditional and emerging communications technologies, including culinary blogs, television, video, audio, and other digital forms. IACP members and non-members are eligible to enter all categories. Awards are given in nine categories to honor traditional and emerging communications technologies, including culinary blogs, television, video, audio and other digital formats. This category applies to Instagram campaigns that are commissioned and used in any advertising, branding, or other marketing campaign focused on food or beverage. The account must include a minimum of 20 posts published during 2017, but more will be accepted and reviewed. This category applies to individual Instagram accounts which are not created by or intended for a commercial enterprise. The account must address food or beverage and include a minimum of 20 posts published during 2017, but more posts by this account will be accepted and reviewed. Entries in this category should be produced by or for a corporate media entity. A series is defined as a minimum of six video programs that originally were broadcast on television or online within the eligible time frame. Each individual video may be of any length. Three episodes must be submitted for consideration. Entries are judged on ability to engage the targeted audience, production quality, information and entertainment value, depth of research, originality, and overall excellence. A culinary-related online publication that is produced by one or more individuals. The site can be an extension of other media such as a television show, magazine, or newspaper. To differentiate from a blog, entrants in this category are more likely to be database driven and/or include user-generated content (such as recipes), rather than simply organized by post or in a journal format. The focus of the site may be primarily news, information, entertainment, and may also be a product or retail site. The site may or may not contain recipes. Sites are judged on mastery of language, clarity of purpose, ease of use, overall design, photography, organization, and originality. Entrants must submit three URLs for specific pages/stories for the judges' consideration, although the entirety of the site will be considered. A blog authored by a group of individuals, either as an independent entity or an extension of an existing media brand. The blog must involve a slate of multiple contributors over the eligible time period. This award is meant to recognize the collective strength of these voices in shaping the final editorial product and reader experience. Entrants should submit no less than three URLs that represent at least three content contributors for the judges’ consideration, although the entire experience of the blog will be considered, and other posts from contributors within the eligible time frame are likely to be reviewed. Entries in this category should be produced by an individual entity. A series is defined as a minimum of six programs that originally were broadcast on television or online within the eligible time frame. Each individual video may be of any length. Three episodes must be submitted for consideration. Entries are judged on ability to engage the audience, production quality, information and entertainment value, depth of research, originality, and overall excellence. A blog authored by a single person, either as an independent entity or an extension of an existing media brand. To be eligible in this category, a blog must involve a single contributor over the eligible time period. Entrants should submit no less than three URLs, although the entire experience of the blog will be considered, and other posts from the blogger within the eligible time frame are likely to be reviewed. This award will recognize excellence in marketing communications. Submissions should include a short statement of campaign goals (150 words or less), plus links to all elements of the campaign. The award will not be based on campaign results, only on the creative execution. Awarded to podcast or radio show originally aired on either radio, podcast, or other online distribution. Programs may be any length. A series is defined as a minimum of six produced programs; three programs must be submitted for consideration. Entries are judged on presentation, informational value, entertainment value, originality, production quality, and overall excellence. Awarded to a work originally aired on television, online, or in theaters. Video may be any length, and may focus on news, entertainment (including humor), instruction or other subject. While submissions to this category may have been part of a series, please note that any video entered in the Culinary Series is not eligible to be re-entered into this category. (Both entries will be invalidated.) Entries are judged on presentation, informational value, entertainment value, originality, production quality, and overall excellence.